Globe recently brought back its FREE FB. This promo allowing subscribers, especially prepaid users to get online on Facebook everyday for FREE! How to register on Globe FREE FB? The same procedure as before. Just key in FREE FB and send it to 8888. However, if you joined Free Facebook previously and didn't unsubscribe from the promo, then there's no need to text FREEFB to 8888 or visit the URL to register again. You will automatically enjoy Free Facebook once it launches. The promo is intended to match with Smart's 30MB free browsing promo. Well, the hype was cleared because obviously, Globe revived the service after Smart announced its free all-site access volume-based internet promo. You can start using FREE FB by accessing http://m.facebook.com/free on a built-in mobile browser or via Facebook App. But you cannot browse through m.facebook.com using BlackBerry browsers since this promo is not supported on Blackberry 7 devices. Too bad for BlackBerry users! Good thing guys! What you might not been aware of is that... Now, you can start visiting Facebook with your Opera Mini browsers. Just connect it with default MyGlobe iNET access point. How come this possible? Globe on its recent FREE FB claimed that Operamini cannot be used as browser to access Facebook—even Nokia Browser. Applies only on year 2013 and first quarter of this year when they'd stopped FREE FB. But within this September 2014, upon checking Globe support page. 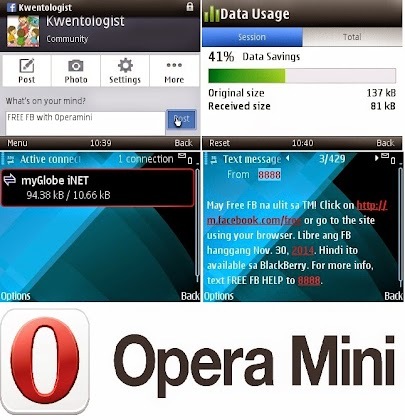 Opera Mini isn't on the list of unsupported mobile browser. This may explain why we can browse FB on Opera Mini. It's not maybe the end for BlackBerry people after all. Operamini is available in many mobile platforms, such as iOS, Android, Symbian, Blackberry OS, and thousands of Java phones. Download it from official Opera website by checking the link inside the box. With FREE FB combined with Operamini you can share, like, and post on FB all for free once again! What are good things about Operamini with FREE FB? And what about the disadvantages? Well, let's us first discuss the bad ones. Only Facebook can be access but not the other websites unless you subscribe to GoSurf or Supersurf promos. About Operamini EULA, you should have already accepted it. This will pop-up only once right after you installed and run Operamini. It's just a first time activation of the browser. So, I guess you need data or WiFi connection that can connect you to Opera server allowing you to accept the End User License Agreement. Sometimes you need DisCo Trick. You know, disconnect the data and reconnect again. Only if the browser doesn't load the page. Operamini load pages faster than any other browser including Facebook App. With Operamini you can open multiple tabs. So, reading notification and chat messages is not a big deal. It has feature for uploading photos on your Timeline, comments, and status update. Saves your allotted bandwidth because Operamini doesn't consume much of your data. Free FB is available until November 30 but will run until further notice. Anyway, don't forget to like us on Facebook. Thank you for reading How to Fully Enjoy Globe FREE FB By Using It On Operamini Mobile Browser posted on the website Kwentology if you want to redistribute this article please include the link as the source. Have some kuwento to share? Contact us!